Hey there, friends! We have been absolutely blown away by the generosity and positivity shown during The Secret Sister Project! Thank you all so much for your kind words to those of us who host, and for being there to provide cheer for one another. It is really something to go through the hashtag and see you all lifting each other up despite only being matched to one “sister.” Your generosity shines through and it is heartwarming to be part of a group filled with strong, uplifting people! On January 16 we will be posting questionnaires on our blogs for you to fill out and email back to us. In addition to the questionnaire, you will also be asked to answer a few questions on a Google form. PLEASE NOTE: If you do not fill out BOTH of these things in full, then you will NOT be paired. The Google form is NEW this round, but it is what we will be using to pair, so DO NOT FORGET. This is a commitment, we can’t lie to you. By signing up to be a secret sister you are promising to send at least one small card AND/OR gift to your secret sister a month depending on the “monetary group” you sign up for. It is very important that you don’t sign up for this unless you are willing to follow through. Please think of how sad (and unfair) it would be for someone to be working hard to make their secret sister feel special and not receive anything themselves! Depending on the group that you sign up for, it may not be necessary for you to send presents. Keep in mind that this really is meant to be more of a cheering up sort of club. Neither do I! This is why we have different price ranges, one of which is strictly pen pals – that means NO trinkets, etc! You should never, ever feel as if your package is inadequate as long as you are meeting your price range “standards.” Trust me, it is much more meaningful if you stay within your price range but then send an extra letter or handmade card just to check in that month! Anyone who is getting caught up on the size of the gifts is missing the entire point of the project and will be dealt with accordingly. Technically, no. You absolutely do need to be bookish, however. We are book people over here! We do have some non-bloggers who have joined us but full disclosure they are people that we know and trust. That is not to say that we won’t allow you in unless you are a blogger, but as this project was started and is promoted in our blogging community, it is filled with mostly bloggers. It was last round! We are going to have to again gauge how many international participants wish to join, and see if we have enough to keep you all secret. Please keep in mind that if you are international and wish to join, you may have to send international in order to be allowed in. We didn’t have to do this last round, and we hope that we won’t have to but we have to gauge interest first! That is wonderful! Welcome! I know it is a little off putting to see the word “sister” up there but honestly we just did that because it sounded better than “The Secret Person Project.” I personally would love a secret bro, pal, dude, or friend regardless of gender and we had a few males join us last round! $5-$10: Send a heartfelt letter to catch your sister up on how things are going that month and then send an e-book, paperback straight from Amazon (thank you Prime shipping! ), baked goods, homemade bookmark or other DIY project, or how about a movie night box with a DVD (thanks to the $5 bin at Walmart) and some candy for a movie night! $15-$20 Any of the possibilities listed above and perhaps a newer hardcover from your sister’s wish-list, some fun socks, fandom tshirt, themed box, get creative!! $25+ The sky’s the limit here, we just ask that you remember to reign it in a bit and remember the goal of this project is for cheer, and joy and forging positive relationships, not excessive gifts. Send those heartfelt letters!! Here is where things differ from last time, and where we go all “mean mommy” on ya. We ask that you pay attention because we are going to hold you to these standards with no exceptions. I am sure that you all realize that we absolutely do not have the time or patience to deal with nonsense and when I say that, it is coming from a place of love and experience as we did have some issues before. If you think this is too strict and “not fair” then we are sorry you feel that way, but we made some exceptions last round and spent lots of time chasing after people and yes, even kicking people out for neglecting to do their part. NOTE: There are no exceptions to these rules unless otherwise stated. Also, If you send back an unfinished questionnaire I will send it back to you. Thanks in advance for understanding. You must “know” the hosts in order to join! The hosts are myself, (@bookaddictguide), Amy (@trippingbooks), and Alyssa (@withthebanned). What does “knowing” us entail? First and foremost, you should be following all three of us on Twitter, you should know our names, and if one of us reaches out to you, you should know who we are. It is embarrassing (for you) when we reach out to you and you do not know that we are the creators of the project to which you belong. (Seriously, there have been circumstances where we had to reach out to someone regarding the project and they didn’t know who we were. Incredibly embarrassing for them.) We are all pretty active on Twitter and really like chatting. Tweeting at us a few times saying “Hi! I want to join The Secret Sister Project!” does not count. We want to get to know you, there are three of us and our tastes range – this shouldn’t be too hard. Not to mention that we have been promoting this project for months and have been telling you to chat us up! We even wrote up a “get to know us” post to make it easier for all of you to chat us up! Please keep in mind that there is absolutely no “vouching” for people you know, so please do not try. Start forging those relationships with us, or you will not be allowed to participate. You must actively use the hashtag #OTSPSecretSister to thank your sister during your time participating in The Secret Sister Project. It is worth mentioning this again, USE IT TO THANK YOUR SISTER!! We get TONS of emails asking things like “It says my sister’s package was delivered last week but I never heard anything?” This is unfair, creates more work for us and quite frankly is rude. Be courteous and classy, thank your sister. If you are not abiding by this, we will ask you to cease in participating. In addition to this “rule,” use the hashtag to interact with one another, ask questions, and answer questions put forth. We promise, this makes the whole project more fun! If we have to reach out to you more than once to ask why your sister hasn’t yet received anything then you will be asked to cease in participating. If you are going to be late, tell us. You will not be in “trouble” if life gets in the way and you let us know. If we have to chase after you, then you will be asked to cease in participating. If we contact you and ask if you sent something to your sister and you say yes but are unable to provide tracking for the package then you will be asked to cease in participating. We DO understand that life gets in the way and time gets away from you, so be honest. We DO NOT abide liars, so keep that tracking handy! If you have not received anything by the end of the month then YOU must contact US. We are not going to be checking in with all of you throughout the month so it is imperative that you let us know if you are not receiving! Please do NOT ever feel uncomfortable reaching out to us to say that you didn’t receive something. We WANT to help you with this, you DESERVE to get cheer as you are sending cheer!! In this vein, we want to emphasize the “you” part of this requirement. We had several instances last round of people telling us that SOMEONE ELSE told THEM that no package was received from their secret sister, but WE had no idea. Confusing, right? This also winds up being frustrating for us, and it creates and extra unnecessary step in resolution. So again, PLEASE don’t ever feel bad or like a tattle tale for reaching out to us if a month goes by and you haven’t received anything yet. You must mail your package so that your sister receives it DURING the current month. You do not have until the last day of the month to mail your package. You will be asked to provide the name and contact info (email addresses, please) of a “buddy” who will be willing to answer questions put forth by your sister. We are asking that you keep this to someone who is in the community and therefore will be easy to contact. Husbands/moms/sisters are not easy or comfortable to contact. This person will only act as YOUR buddy. They will not be acting as moderator for the hashtag or as a stand-in for any of the hosts. This list MUST contain books that you are not going to purchase for yourself. IF you simply cannot resist a title here or there then please let your “buddy” (see above) know PRIOR TO BUYING so that they can tell your sister – but please refrain from doing this. Do not give anyone else access to this list. Not parents, husbands, friends, co-workers, secret santas…NO ONE. We had a lot of people buying things their sister already owned due to someone else buying off of this list, and it was a waste of money and went against our specified rules. We are asking that you put a little more emphasis on the “pen pal” aspect this round. This means if you have signed up for one of the higher price ranges, you should still send a letter here or there to your sister. This is one of the things people have been asking for, so be prepared. NOT OK to say: “Please send this to me…” while providing links to something expensive or “#OTSPSecretSister this toaster would look excellent in my new apartment!” Even linking to something you think is super cool while using the hashtag seems grabby, and believe me, we see what you’re doin there, so let’s not. Things such as “Wow, I wish I knew if my sister got her package” or “I wish my sister would use the hashtag more” are statements that promote negative communication. We will see them, and we will call you out. If you have issues like this, reach out to the person your sister designated as her “buddy” or to one of us and we will do our best to solve any issues. Do not send your sister ARCs unless you are also sending additional things to compensate as we know no one pays for ARCs and you are to abide the monetary limit. Do not send packages straight from Amazon. We had some people who completely forgot about their sister and then sent things directly from Amazon to try and make up for it. This is not okay. The emphasis should be on the cheer and the thought that you are putting into your sister and her happiness. Use the hashtag and interact with one another! The whole point is to bring positive feelings into the our community. Be as thorough as you can when answering the questions. There is no “writing too much” when answering these questions! Remember that this project is The Secret Sister Project, wouldn’t you expect your sister to know LOTS about you? The best advice I can give you is to be creative and keep in mind the entire reason for the project is NOT about gifts, but fostering a positive environment. If you are looking for ideas, chat us up, we would love to help! Or ask your fellow sisters! I saw some fantastic monthly themed packages last round including book subscription boxes one month! We tweet from our own handles pretty frequently, but don’t forget to follow us all over at On the Same Page! We can’t say this enough…please PLEASE only sign up if you are willing to send something monthly and give 100% to this project. Though we had very few issues the first round, each round proves to be more difficult and frustrating. Please recognize that this is a commitment and that there is someone out there relying on you to follow through. Not to mention the fact that the three of us have full time jobs and busy lives, we love hosting this project but absolutely loathe having to chase people down for being inconsiderate. The sign-up post with all questions that need to be answered will be posted on our blogs and promoted via Twitter starting on January 16. Do NOT send a sign-up email prior to seeing the post on January 16. If you do, we will delete the email and we will assume that you do not know how to follow directions and therefore cannot trust that you can handle being a part of this project. Sign-ups run for two weeks until January 30, so you will have plenty of time. We hope that this post has been helpful to you, friends! If you still have any questions then please reach out on Twitter. If you are new to the project then I encourage you to use the hashtag to talk to your fellow sisters as they may have the answers you are looking for! Thanks for sticking with us and being so generous and kind! 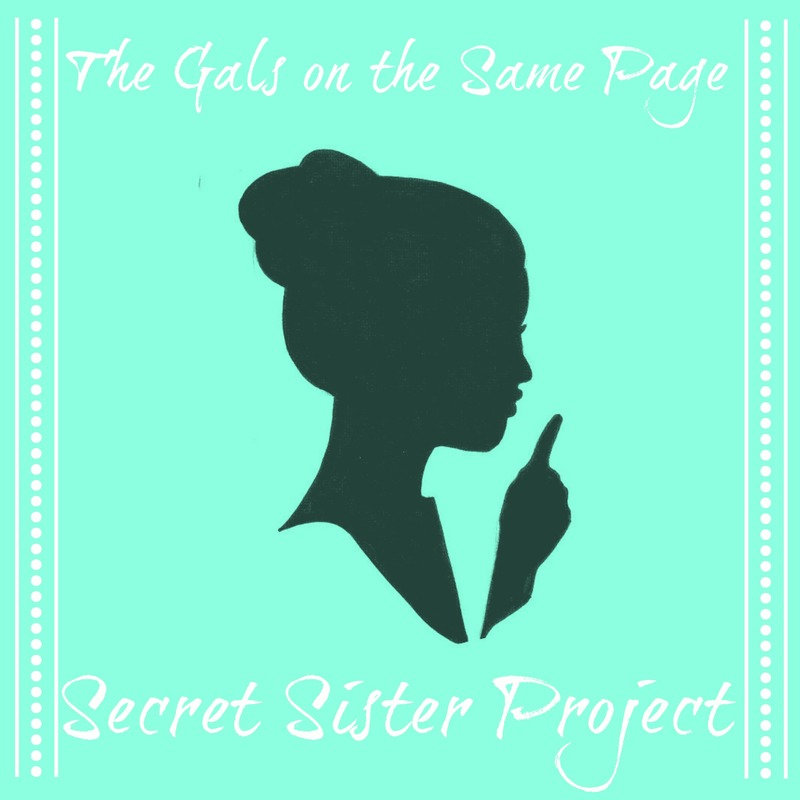 On the Same Page: Secret Sister Project | Round 2 On the Same Page: Secret Sister Project | Round 5 Pre-Sign Up FAQs + Info On the Same Page: Secret Sister Project | Pre-Sign Up FAQs + Info On the Same Page: Secret Sister Project | Round 3 Sign-Ups! This entry was posted in Blog Event, Books and tagged Blog Event, On the Same Page, Secret Sister on December 28, 2015 by Brittany. Hi, Brittany! My buddy this round was one of my real life best friends who isn’t in the blogger community. Do I need to find a blogger who is willing to be my buddy, or can I keep the one I used during round 3? Hi Emma! It doesn’t HAVE to be a blogger but some people had used their mom/husband, etc and some participants actively avoided using the buddy because they felt weird contacting someone’s husband or mom. I think friend is fine. We were just asking that it be someone in the community if possible so your sis might feel a bit better about contacting a stranger. That should be fine, especially if they were already a big help in round three! I was going to ask the same thing. One of my best friends was my buddy this round but she isn’t part of the book community. She works in social media so she checks her email consistently and is reliable to respond to whoever I’m paired with. I don’t have any close friends in the blogging community who I’d feel comfortable asking to do it :/ Sounds like I’d be okay to use her as my buddy again? Thanks Brittany (and Amy and Alyssa!). I suppose we should say that it’s HELPFUL to have someone in the community so it’s a familiar face but it definitely doesn’t have to be. Friends are absolutely welcome and helpful. We had more issues where someone was actively avoiding contacting a buddy because it was someone’s husband or mom and they felt uncomfortable with that. Especially if your friend was a buddy in a previous round, there should be no issues at all! I’m pretty new to the community and, to be honest, I hardly know anyone in it except for the blogs I visit. Is it possible to participate? I see there are a lot of things requiring knowing someone else in the community, but in my situation I don’t really know anyone. I mean, I think this is a good way to get into the community or get to know new people in the community, but I’m feeling a bit like newcomers won’t be able to. Hi! As stated, we have had several people join who aren’t even bloggers. We just want to get to know participants a little bit before the project starts so we can tell that they are genuinely interested. Our issues with previous rounds were that people signed up and then ended up not following the rules/guidelines. We are happy to have anyone join in who is genuinely interested! We ask that people get to “know” us a bit so we are just familiar with who you are and your interest in participating. If you chat with us a bit on Twitter/our blogs, you should be good to go! We have no specifications at all for being a book blogger or having blogged for a certain amount of time. The project is ALL ABOUT creating community so we of course want new people to join in and find some wonderful friendships. I love that there’s a pen pal option this round! I love that a lot, even though I’m planning to continue with one of the other options. The pen pal option makes it so much more doable for international participants, and people could be easily paired from different countries without huge expenses to send cheer 🙂 Awesome idea. If I participate again next round, I’m excited to use things I’ve learned from Round 3 (my first) to make the next one even better. I already have some ideas! Potentially stupid question, but will the pen pal option be like you and your secret sister have each other? or will it be set up the same way otspsecretsister has been set up in the last rounds? So you would have two pen pals? I’ve seen so many positive tweets about this before, but never knew when/how to sign up! I love how this creates such a loving community ♡♡ thanks for all the hard work ladies! !